It's easy to turn basic marshmallows into pretty flower decorations! All you need are 3 ingredients and about 10 minutes to create these cute little flowers. This quick tutorial will show you how to make several different types of marshmallow flowers. 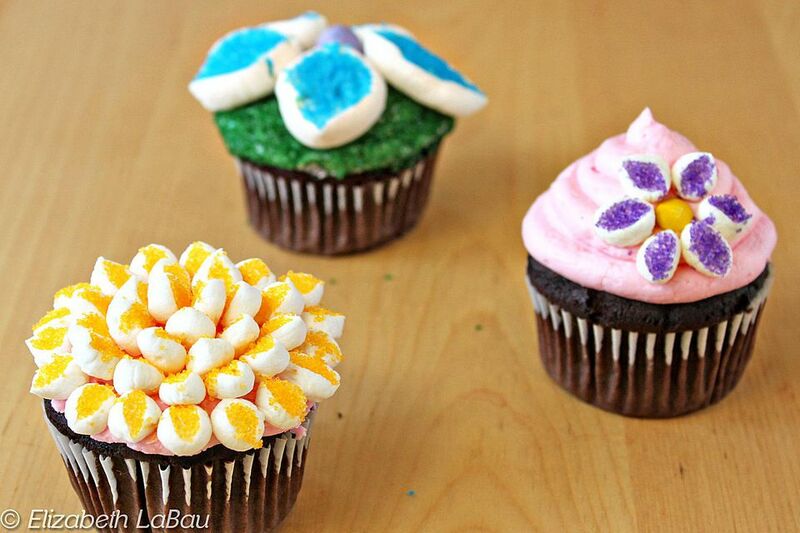 Use your completed flowers to decorate cupcakes, cakes, tarts, or even candies like truffles! There are several different flower designs you can make with marshmallows, but they all follow the same basic procedure. To get started, empty each container of color sprinkles or colored sugar into a different small bowl. To make flowers with large marshmallows, use kitchen scissors to cut the marshmallows into thirds widthwise. You will end up with three slightly squished ovals. Use your fingers to shape the ovals, rounding out the middle and pinching the ends closer together to make them look like flower petals. Dip the front of the petals in the colored sprinkles--the stickiness of the marshmallow will make the sprinkles adhere to the petals. Arrange them in a circle on top of an iced cupcake, five or six petals to a flower, and finish by pressing a round candy in the center of the flower. If you don't want a huge flower that covers the whole cupcake, you can use this same procedure with mini marshmallows. To do this, cut the marshmallows in half width-wise, and press them into the colored sprinkles. Arrange six marshmallow petals in a circle and press them onto a frosted cupcake. Finish by placing a miniature candy in the center of the flower. You can make one flower per cupcake, or arrange 3-4 flowers at different intervals on top of the cupcake. These flowers can also be used to decorate candies, as in this recipe for Double Chocolate Easter Eggs. If you want to get more complex, you can use miniature marshmallow petals to cover the entire top of the cupcake, as in the yellow flower in the example photo. To make this design, cut your miniature marshmallows in half widthwise and press them into the colored sprinkles. Arrange them in a circular pattern all along the outer edge of the cupcake. Once that circle is complete, make a second circle inside the first, and continue making smaller circles until the top is entirely covered with petals. Click Here to View All Marshmallow Candy Recipes! Make Your Own Pumpkin Marshmallows! Chocolate-Covered Cherry Marshmallows: Even Better Than the Original?